This post is prompted by a remark made by my good friend Wei Lin. She saw me reading a card I had received from a friend recently and said: "Traditional cards are so old-fashioned." I wondered if that was true and decided to probe into the issue. A Google search revealed numerous articles on the debate between traditional paper-based cards and e-cards. Tracey Grady's examination of the pros and cons of each type is informative. In my opinion, e-cards are not substitutes for the real (traditional) ones and they shouldn't be. I treat e-card e-mails with suspicion because spammers could be using them to download viruses and software onto my computer. I have never sent anyone an e-card and I don't plan to; I dislike the cold impersonality of conveying greetings electronically. I have always liked sending and receiving cards the traditional way. The ritual of going to a bookshop, browsing at the card section, picking a suitable one for the recipient and then walking to a post office nearby to mail it always gives me immense joy. After that I will proceed to the nearest cafe for a nice cup of coffee to muse on my choice of card. 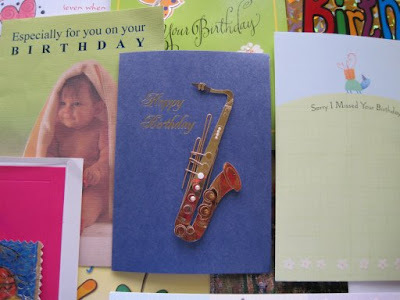 Admittedly, the traditional method of buying and sending cards can be time-consuming, if you have deadlines to meet. But it is worth the effort because the giver gets as much pleasure as the receiver, if not more. Hallmark market researchers talk about "the emotional power of an unexpected card" and "sending a card is one of the biggest little things you can do to make someone's day". "People are returning to a focus on basic human connection, reaching out and letting people know they’re loved and appreciated or just to say thanks," said Tressa Angell, Hallmark senior product manager. I totally susbscribe to that view and I think we should often tell our family, friends and loved ones how much they mean to us. The current economic recession is not likely to harm card sales, say industry watchers. Indeed, cards can be replacements for gifts during times of financial difficulty. Make your own cards, if you feel so inclined. We must stay connected with those who matter to us. I can't believe you still kept that card. I don't even remember giving it to you. How long ago was that? I like traditional card too! I like the feeling of holding it when I received one. It's warm! i am glad you feel that way too. how about handmade cards from you??? i am sure you will find many fans who will want to buy them from you. I've kept most of the cards given to me for all occasions. Many are irreplaceable, including for sentimental reasons. They serve as reminders of those people who appreciated me and who took the trouble to send me the cards. E-cards are convenient for those with no time to send out physical cards, but they have a limited lifespan and after a while, they are gone and no more. In any case, it is good to always be given the choice, so that we can do whatever is most practical in each case.